Each interactive video guide (answer keys included) in this set are sold individually in my store, and if you were to buy each separately the total would be $40, however if you take advantage of this amazing bundle you'll save $10! Don't miss out on this fun and educational set! Wanda's been so busy planning this year's Fall Fun Feast that she forgot about the food. Now her only hope is a farm that's supposedly haunted. Gulp! 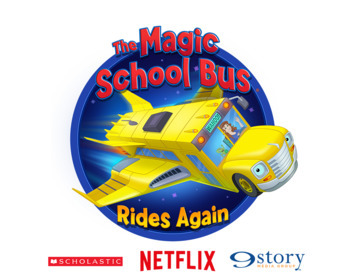 Ms. Frizzle and the class race across the internet to recover a digitized Arnold before Jyoti's grandmother accidentally deletes him. The kids learn to see the world through the eyes of different animals when a careless Arnold loses Carlos's pet rat -- then turns her invisible! Episode 6 - Ready, Set, Fail! While building (and rebuilding) their own space rover to tackle the terrain on a faraway planet, Jyoti and the class learn that it's OK to fail. A race between competitive brothers Carlos and Mikey takes the gang on the top of an in-pasta-ble mountain, where they learn about simple machines. The kids go looking for rain to test out Jyoti's latest invention, "The Autobrella," only to wind up with their heads stuck in the clouds. A little math helps Raplhie make complicated midair calculations when his cousins recruit him to join their high-flying circus act. Ralph doesn't believe Tim when he tells him that trees can talk, so Ms. Frizzle takes the class to a forest that's louder than it looks. Every person and animal poops. But the class isn't convinced that this so-called "brown gold" is as valuable as DA's famous inventor uncle says it is. The bus takes Ms. Frizzle and the class deep inside Arnold's cousin Janet to learn why our genes makes us look, act and feel the way we do. A field trip to the center of the sun takes a dangerous detour when the school's safety-conscious principal, Mr. Ruhle, tags along.